N-Tron series unmanaged industrial Ethernet switches offer simple plug-and-play functionality with reliable performance. Available in an endless range of port options, our rugged switches are set to tackle the demands of industrial data acquisition, control and Ethernet I/O applications. N-Tron series Ethernet media converters are designed to extend communications links and bridge connectivity between disparate types of media, connectors or speeds. Providing fast performance and rugged operating specifications, our DIN-rail mountable converters include copper, fiber, fast Ethernet and Gigabit options. N-Tron series industrial Ethernet switches with monitoring capabilities provide the simplicity of an unmanaged switch with advanced remote diagnostic capabilities. Our monitored switches perform in harsh environments and offer ease of deployment. N-Tron series ESERV and Ser converters make it easier to transmit serial signals over long distances. 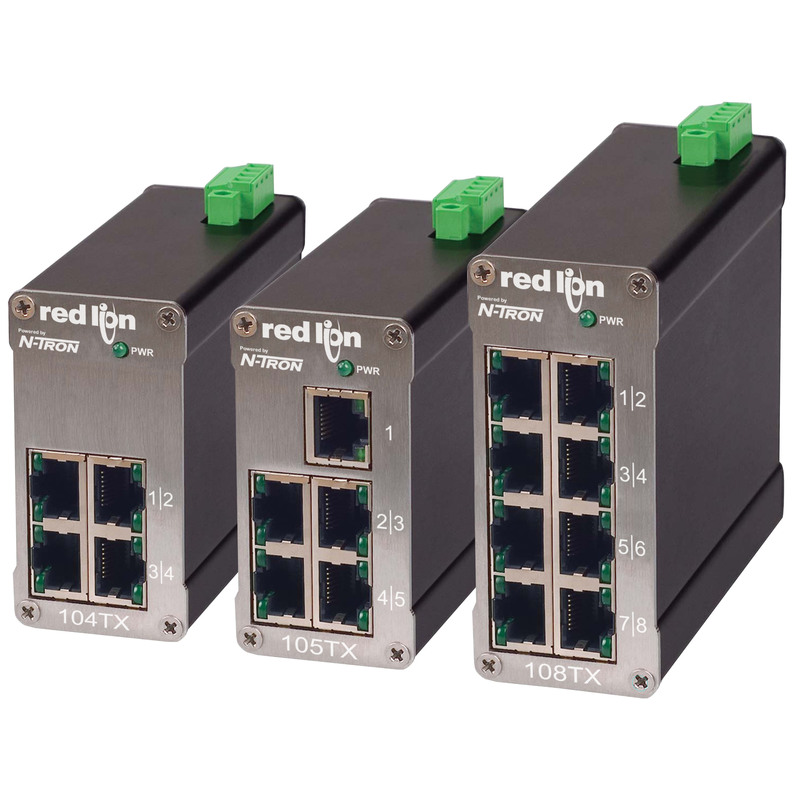 Choose from simple serial converters to drag-and-drop configurable Ethernet gateways that work with Red Lion panel meters. N-Tron series managed industrial Ethernet switches provide the ability to configure port settings, manage network traffic and remotely monitor your network for critical issues. Our managed switches are designed to operate in harsh environments and offer best-in-class performance. N-Tron series industrial IEEE 802.3af/at Power over Ethernet (PoE) solutions are designed to transmit power and data over Ethernet, eliminating the need to run separate cables saving time and money. N-Tron series IP67 and OEM embedded switches offer solutions for the harshest environments. Available in unmanaged and managed models, our IP67 switches provide an incredibly robust solution for mission critical deployments. N-Tron series Wi-Fi radios offer industrial protection, outstanding performance and extreme reliability under the harshest conditions. IEEE 802.11n support allows our Wi-Fi radios to utilize three antennas and Multiple-In, Multiple-Out (MIMO) technology for increased data throughput, while also providing 802.11a/b/g backwards compatibility.